PRONOBOZO – NEW ALBUM ‘I WAS THERE’ AND THEIR COMPLETE BACK CATALOGUE OF MIXER STEMS ‘THE STEMS’ DUE FOR RELEASE OCTOBER 26th. Pronobozo, has confirmed the release of his 3rd studio album ‘I Was There’ on October 26th alongside ‘The Stems’, the complete mixer stem collection of his rich back catalogue of work. ‘I Was There’ is one of Pronobozo’s most exciting and accomplished pieces of work to date. Recorded at ZOE Studios, Toronto, the 11 track album is a heart pounding, blood pumping display of energy filled tracks showcasing Pronobozo a master of his machines. Tracks ‘Battle Anthems’, ‘Coming Back’ and ‘Future is Here’ have the Pronobozo trademarked style of caffeine infused beats and build ups geared towards gaming, late night programming, free running, and martial arts. The title track ‘I Was There’ sees Pronobozo team up with Les Stroud (Survivorman) on instruments with Zoe Holman and Juan Barbosa on vocals pulling together a powerful story detailing the corruption and recklessness of a megalomaniac businessman. If you have been craving that 90’s electronic music scene akin to The Prodigy, The Crystal Method, or something you’d find on the Hackers soundtrack, Pronobozo brings a similar ‘high tech low life’ vibe to ‘I Was There’. With the success of past hits such as ‘Every Day is a Saturday’, ‘Full Flex’, and ‘Against the Grain’ you can be assured the new album will provide the same healthy mix of electronic styles and energy. Pronobozo’s album is set for Oct 26th release, previews and pre-orders can be found on iTunes immediately. FIRST HALF OF THE BIG ANNOUNCEMENT! From the first pronobozo album Zero = One = Everything I will be releasing ALL the mixer tracks renders (mixer stems) from ALL the songs. Free to use and modify under CC BY SA 3.0. Final sorting and packaging is being done this week, next week there will be seeding of a torrent and finally at some point I’ll have the direct downloads from my website. NEW ALBUM! PRONOBOZO I WAS THERE | PRE-ORDERS LIVE! 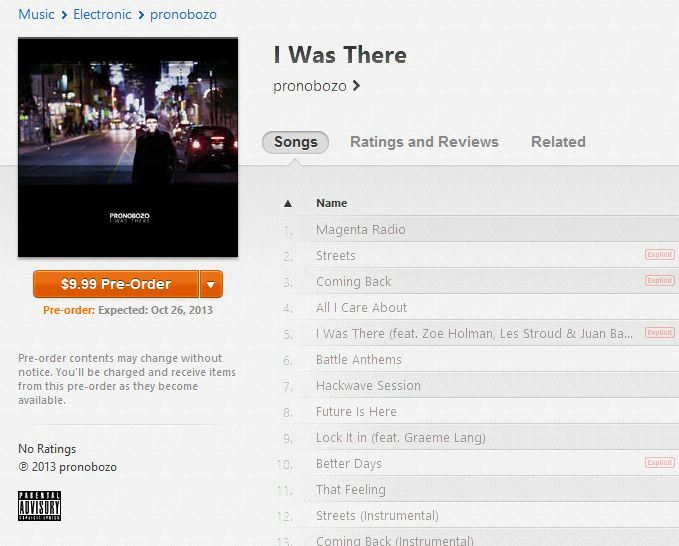 The new PRONOBOZO ALBUM “I Was There” is now live for PRE-ORDERS. Get it TODAY! Is it only available on iTunes? PRE-ORDERS are setup for iTunes as it’s my only option. After that period the album will be available on Spotify, Amazon MP3, Google Play, Rdio, Deezer, Xbox Music, Rhapsody, eMusic, simfy, Muve Music, Myspace music, iHeartRadio, Nokia, MediaNet, VerveLife, Wimp, Sony Music Unlimited. Yes, after PRE-ORDERS and a grace period the album will be available for free from www.pronobozo.com . It will also be under the same CC license. Can I get it in FLAC? Through the online stores FLAC is not an option, but from a request I will be providing FLAC on my website or by torrent in the future, after PRE-ORDERS and a grace period. In this case a grace period is where I try to make money before everything is torrented. hehe.